This weekend, as part of Thanksgiving festivities, I found myself running in Owensboro, KY where my in-laws live. Besides the fabulous food (try Moonlite BBQ and Old Hickory BBQ for amazing smoked mutton) and our wonderful family, Owensboro is home to the great Adkisson Greenbelt paved trail system that continues to grow. I was happily surprised at the resources and thinking that’s gone into this running/biking path system so far. A view of the Greenbelt path on the south side of Owensboro, KY. The Greenbelt path will eventually encircle the entire city and make crossroads through the town itself. 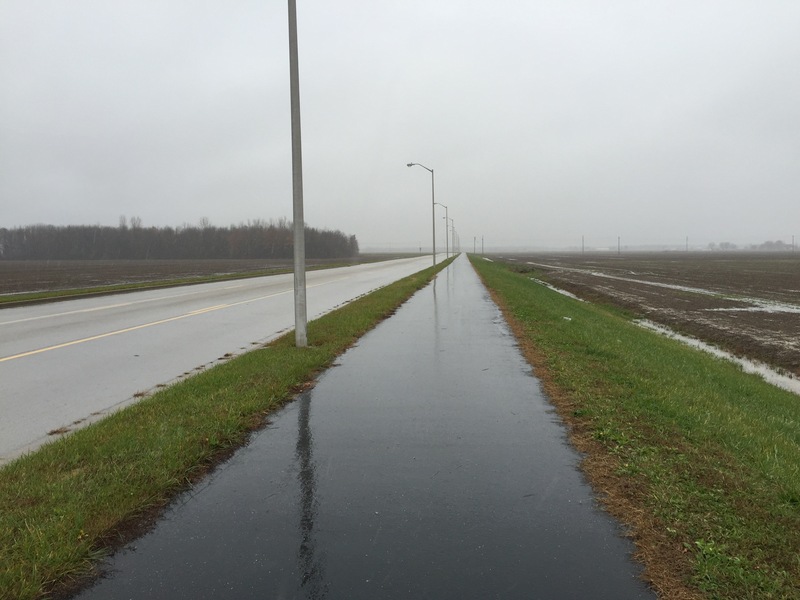 I did my Thanksgiving Day run on a portion of the trail that starts at a sports park and then winds its way to border the local airport with a minimum of road crossings which are well-marked and safe. The path itself is about 10 feet wide and paved with mile markings every tenth of a mile. For most of the trail, there is signage about the flora that borders the trail. On Saturday, I went back to the Greenbelt for a longer run in a steady rain. This time, I went past the airport and found myself on the newer part of the trail that cuts through some starkly beautiful fields. Despite the rain, or maybe because of it, there was a profound peace that settled over me as I moved through the halfway point of my run. The path is nice and flat so it was easy to keep cruising through my longest run so far. Turning back to town, the trail becomes more of just a sidewalk and it seems like the city has commitments to improve all the paths and signage as the Greenbelt moves back into the city. I made the mistake of reading the map and assuming all the colored bits were Greenbelt but some of them are bike paths including some roads marked with sharrows. These aren’t exactly great for running but it worked out given that there wasn’t much traffic and there was decent light in the middle of the day. Owensboro is a city that is very committed to sports facilities and the Adkisson Greenbelt park trail is a great addition to those facilities. 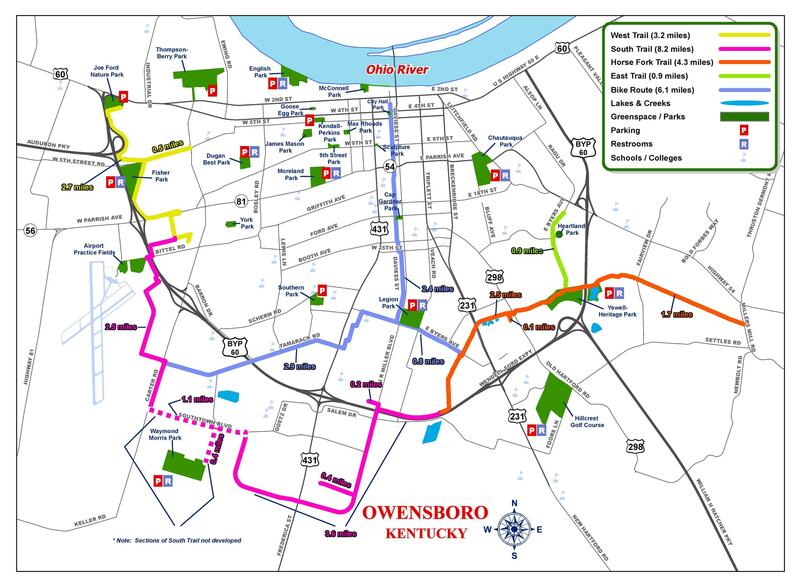 Check out the map below and if you find yourself in Owensboro, put some miles in on the Greenbelt.